Continuous Cash Flow exhibits a flexibility and entrepreneurial awareness rarely demonstrated by banks and other secured lenders. With Continuous Cash Flow, you won't have to wait weeks for a loan committee to make a decision on your application. We can often advise you within 24 hours if you qualify for our factoring program. The term "factoring" refers to the outright purchase and sale of accounts receivable (A/R) invoices at a discount from their face value. Growing numbers of small and mid-sized companies have begun to explore factoring as a practical source of working capital. Since factoring represents the sale of an asset, factoring enables companies to obtain working capital without taking on new debt or giving up equity. Numerous young businesses rely on factoring to help them reach the point where they become viable candidates for bank financing or equity funding. 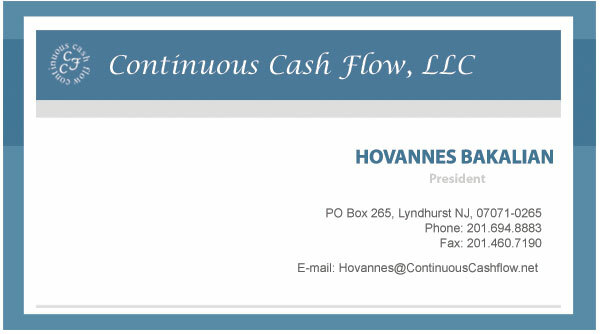 Continuous Cash Flow was founded to serve as an alternative source of financing for small growing businesses nationwide. We recognize the delicacy of the relationship between our clients and their customers, and take great pains to ensure that direct contact always remains cordial, courteous and businesslike.